Who Benefits? Everyone Who Tries It! Multiple muscles can be worked at the same time or you can isolate specific muscles. Each participant is able to work at their own intensity unlike land sessions where you feel it is necessary to keep up with the instructor. Participants feel safe in the water. They are not going to fall and hurt themselves- They work in water that is at a level comfortable to them. The Five "Magical Properties of Water"
CALA Aquafitness Movements Use the 5 Properties of Water. Water workouts are a great way to get fit and to keep fit! The unique physical properties of water provide an ideal environment for exercise. The natural buoyancy of water reduces weight bearing stress, allowing greater ease of movement with less strain on bones, joints, and muscles. The increased density of water creates even and fluid resistance in all directions, comfortably toning and strengthening muscles with greater balance and efficiency. Turbulence, hydrostatic pressure, buoyancy, resistance and thermal conductivity are all properties that make water a magical environment in which to move. Turbulence creates an unstable environment encouraging the core muscles of the body to become stronger to maintain correct position and posture. Turbulence can be manipulated to make an exercise easier or harder. The density of water is approximately 1000 times greater than air. The intensity of the workout can be greatly altered by changing shape / size / and, or speed of the moving body parts. Increasing the speed of motion while maintaining surface area and range of motion will cause an exponential increase in the work done. Every movement performed under the water will encounter resistance. This means that the body will meet resistance in every direction of movement. Resistance of water dampens the speed of motion and the end point of each movement thus preventing or diminishing the occurrence of jerky movements and the risk of injury. The energy expenditure in water is similar or greater than on land because more stabilizer muscles are used during water exercise, especially if it is performed while suspended in deep water. The buoyancy of water decreases the amount of shock which is transmitted through the bones/joints/ligaments on landing, while in chest deep water. In deep water, there is no impact, therefore no shock to the body. Buoyancy decreases the effects of gravity: Body weight is reduced by 75–90% (chest to neck level immersion). An individual who weighs 70kg on land will weigh about 7kg in neck deep water. Special populations including the obese, the elderly who may have fragile bones, the arthritic, the disabled, the injured athlete, as well as pre and post natal women will exercise with relative ease in the water. The force of buoyancy assists in venous return. On land, the downward force of gravity pushes blood toward the feet. The cardiovascular system works against gravity to return blood to the heart. In the water, the up-thrust of buoyancy counteracts the downward pull of gravity thus assisting with venous return. This will contribute to lower exercise heart rates during aqua-fitness! Water exerts pressure against the body acting like a full body support hosiery during water exercise. HP assists participants to exercise more vigorously with less strain on the cardiovascular system. HP reduces swelling in injured/swollen joints or limbs that are immersed. The pressure of water on the chest wall creates a training effect for the respiratory muscles. Water conducts heat approximately 25 times faster than air. 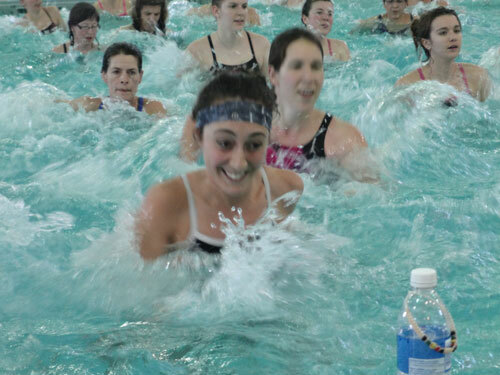 The water ‘wicks’ away excess body heat during exercise, creating a cool, comfortable workout environment. The heart does not have to work at keeping the body cool, instead it works to enable the workout to continue. The recommended pool temperature for aqua-fitness is between 82-87OF.